We all know how important it is to maintain a balanced diet these days, but a balanced diet is often hard to keep up with when modern life is so frantic and there’s so many tempting fast food options available on every street corner. That’s where HelloFresh steps in to save the day. HelloFresh is a food subscription service with a difference: everything is farm fresh and delivered to you with healthy meal plans which save you time and means you no longer need to step inside a supermarket. Sign up for a HelloFresh weekly subscription and get a box of goodies delivered to your doorstep, complete with recipes that are fast to follow through. Choose from a Family Box, Classic Box, Veggie Box, and then supplement that with a Fruit Box or a Juice Box if you want to go the whole hog to complete your healthy lifestyle! Impress your friends and family when you cook with a treasure trove of farm fresh vegetables, grains, meat, fish and cheeses. The recipes change all the time, so you’ll never get bored, and most have a cooking time of sub 30 minutes, which is ideal if you’re short of time in the evenings. How do I use my HelloFresh promo code? Check out the latest promo codes for HelloFresh listed on vouchercloud. You’ll be redirected to the Hello Fresh website, then you can start shopping. Click green ‘got a promo code’ text on the right, paste your promo code in the box, click ‘apply’. Click green ‘Go to checkout’ button at the bottom of the page. Get all the juiciest, freshest HelloFresh news, special offers and product launches delivered to your inbox when you sign up to the mailing list. Can I customise my HelloFresh subscription? Some products are customisable in terms of meal selection but HelloFresh is not able to customise individual meals based on preference. Will I incur a fee if I want to re-schedule my HelloFresh order? Yes, if you break the original delivery agreement, you may incur a $15 fee. Can I get Qantas points with HelloFresh? Yes, read more about it here. 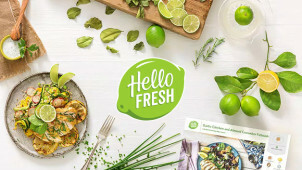 HelloFresh currently delivers to multiple areas in South Australia, Victoria, New South Wales, Queensland and the Northern Territory. There are plenty more locations that will be added to the delivery list soon. Log into your account, choose the subscription you wish to cancel, and simply click the ‘Cancel my subscription’ button. HelloFresh is an online only service, so you can shop whenever you want. HelloFresh is a new and exciting home delivery and meal plan service offering only the healthiest and freshest ingredients. If you’re short on time but want to keep to a healthy eating plan, HelloFresh takes the stress away and does the hard work for you. Use a HelloFresh voucher to sign up to a subscription service tailored to meat eaters and vegetarians alike. There’s a great range of boxes available for delivery every week, and you can add extras such as juice or fruit boxes. HelloFresh has an awesome mobile app, which is perfect for keeping across your orders while you’re on the move. You can download the app on Apple App Store or via Google Play. Browse through a vast array of recipes, which are mobile-friendly and easy to scroll through. You can sort, share with family and friends, rate your experience and add your favourites to your archive. Manage your subscriptions, and track your orders - all at the touch of a button. It can be really tricky to juggle meal times when you’re a big family, which is why you should turn to HelloFresh’s Family Box subscription to take the planning stress out of your meal times. Choose the Family Box and use a HelloFresh promo code to shave money off your weekly subscription. This box option includes family-favourites, goes easy on the spices for less developed palates, but delivers big fresh flavours with its healthy mix of vegetables, meat, grains and a smidgen of dairy.